Now why would we start off this lifehack with a thank you in Swedish? Well, today we're going to be talking about our favorite furniture concept store - IKEA. In case you were wondering, this post is not about 10 cents meatballs (after the horsemeat scandal). 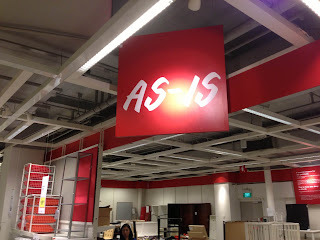 Lifehacksg#13 recommends for you to check out the "As-Is" section at IKEA if you're looking for some bargain hunting. We're talking about actual IKEA products at greatly reduced prices. Now how does this work? Sometimes, there's nothing worth taking home; but sometimes, there totally is! The section is updated from time-to-time and hence if you don't fancy/are disappointed in what you find the first time round, do check back a month later to see if there are any good bargains on offer. Tip: If you plan to check out the "As-Is" section, it is highly recommended that you do not get distracted by the beautiful flawless IKEA furniture layouts beforehand. In fact, it is advisable to walk straight to the "As-Is" section to look for bargains.